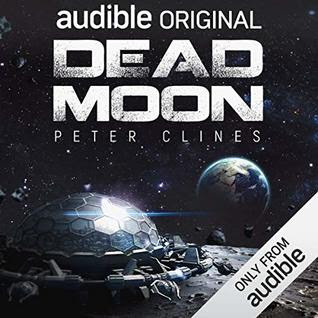 Dead Moon is a science fiction/horror book by Peter Clines. And maybe everyone on Earth, too. I'm going to jump straight into the selling point of Dead Moon: zombies on the moon! Well, that and the fact that it was written by Peter Clines and narrated by Ray Porter. The only other Peter Clines books I've read are 14 and Ex-Heroes, but I loved them - especially 14. I don't have a lot to say about Dead Moon because it was mostly just fun action. There wasn't a lot of character development or anyone to really get attached to, but I still enjoyed the ride. The moon setting and all it entailed was the heart of what made this a unique zombie story, but I was happy to see another layer to the monster madness added in as well. Dead Moon was a fun read that didn't require much effort on my part as the reader. It was just the right book when I needed it. I've not heard of this author either but this could be a great starting point - by the way, I'm having trouble leaving comments on some sites so if you received two comments then apologies. I'm sorry you are having trouble with comments. Your comments always post OK, but my email notifications want to say you are spam. I wonder if you inadvertently made it on a list somewhere. :( I had to email askimet one time to be removed from their spam list. My wordpress comments weren't being allowed anywhere. Ray Porter is awesome! I'm definitely going to grab this one from Audible.